Giant boulders that make up Remarkable Rocks. 1. Flinders Chase National Park - Admirals Arch, Kangaroo Island Wilderness Trail, Remarkable Rocks. Get about on day hikes, multi day hikes, guided tours or cruise in your car. The coastal views, rough cliffs, and natural scrub combine beautifully (of course, it's Mother Nature). And animals? There are kangaroos, Cape Barren geese, a smelly seal colony (which is totally worth persisting with), and various bird life. Pups at Admirals Arch... playful and inquisitive. Where the southern ocean hits Kangaroo Island - dramatic and beautiful at once. 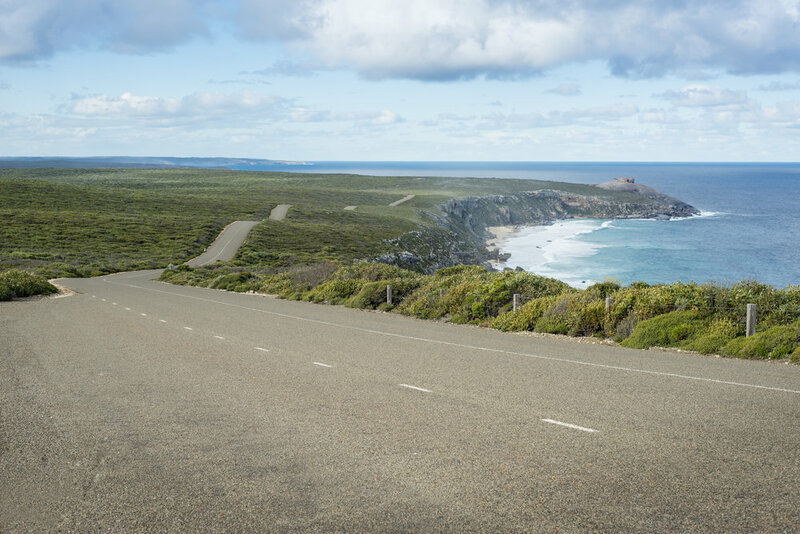 The road to Remarkable Rocks. The road that leads into the park. Just wandering about... the entrance to the the last campsite of Kangaroo Island Wilderness Trail. Remarkable Rocks. They truly are. 2. Seal Bay - there aren't too many places I know of where you can get so close to these cute animals. Stand on the beach with them, watch the males fight, smell their unremarkable stench, hear the pups cry for their mums to return from fishing. A guide is always with you ensuring we don't get too close - although the seals sometimes don't know the rules, coming right up to groups to say hello. While I was there, a little pup came sliding down the dunes right up to a group. He checked them out then waddled on. Meeting cute critters at Seal Bay. Tourists can't approach the seals but nothing stops them coming up to tourists. Where's mum? The young seals let out mournful cries while searching for mum and the food she brings back for them. 3. Little Sahara dunes - clamber up the top then whizz back down on a toboggan or sand board. Repeat. Grab some beautiful views while there too - it's worth risking the camera (or keep it in a sealed plastic bag to improve your chances of a sand free camera when you slide back down. This place is just fun. Prepare to get sandy. Wind patterns atop the dunes at Little Sahara. Don't let the legs get away from you... running down Little Sahara dunes. Monkey fun at Little Sahara. Where the dunes meet the bush. Little Sahara.